These easy Instant Pot carrots are coated in a delicious honey butter glaze. Everyone at the table will want seconds! The best veggie side dish. It frees up counter space (e.g. if you’ve got company over or you’re making these for a holiday like Thanksgiving or Christmas). It’s pretty hands-off once you’ve closed your IP’s lid, so you can do other things instead of babysitting them. Add chopped carrots (or you can just use baby cut carrots) to your Instant Pot along with 1 cup of water and cook for 2-3 minutes on high pressure. I bought large carrots and cut them into fairly big pieces. I cooked them for 3 minutes and they ended up quite soft; just the way I like them. Want to make these in the slow cooker? Try my Crockpot honey glazed carrots. This electric pressure cooker carrots recipe was a big hit in my house. I was barely able to photograph them without sneaking bites. I’m a big fan of sweet carrots. I also have an Instant pot carrots and parsnips recipe, a honey roasted carrots recipe, and a maple roasted carrots and beets recipe that you may also like! Love easy Instant Pot side dishes? You may also like my Instant Pot corn on the cob recipe, this Instant Pot beets recipe, or my Instant Pot mashed potatoes. 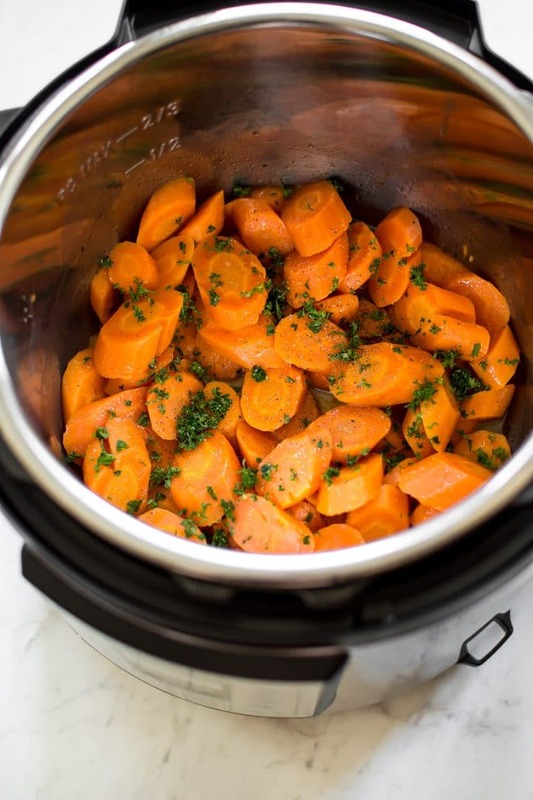 Have you ever made carrots in your Instant Pot? These honey butter carrots are definitely worth trying. These easy Instant Pot carrots are coated in a delicious honey butter glaze. Everyone at the table will want seconds! Cut carrots (or use pre-cut carrots if you wish) into fairly large pieces (I cut mine on an angle - see photos). Add them to your Instant Pot, along with the water. Close the lid, set the valve on "sealing", and cook on high pressure for 2-3 minutes. If you like softer carrots and/or are using large carrots, I suggest cooking them for 3 minutes. If you prefer crisper carrots or are using smaller carrots (e.g. baby cut carrots that look fairly thin), cook for 2 minutes. It will take about 10 minutes for the Instant Pot to come up to pressure. Once the countdown has finished, carefully do a quick pressure release. Take the lid off as soon as it's done (or carrots will continue cooking), and take the insert out and carefully discard the water (leave carrots in the insert). Put the insert back into the Instant Pot and add in the butter and honey. I set the lid back on top for about a minute to help the butter melt. Add the salt & pepper and parsley and give it all a good stir. Transfer to a serving bowl and enjoy. You can use more than 2 pounds of carrots if you wish; cooking time won't change. Stove-top method: Boil carrots until they're tender; drain, then toss with the butter, honey, parsley, and salt & pepper. You clearly made more than enough for you and the husband. Bring me some now. This was a hit at my house. I used a two-pound bag of the baby cut carrots and pressure cooked them for three minutes. I’ll try two minutes next time, as I would prefer a little more crispness. I’m so happy you all enjoyed it, Bonnie!! Thanks for letting me know and sharing the tip re: baby cut carrot cook time. Excellent! I made these as a quick last minute decision. My family raved about them, and I could not be more pleased with the ease of preparation. That’s awesome!! So happy they were a hit, Ashley. Omg yum! I only used 1lb if baby carrots. Same water and cooking time. I added a TB of brown sugar and cut the honey to 1TB. Added clove, ginger and nutmeg. Absolutely perfect texture. Yay!! Thanks for letting me know! I’m planning to make this for thanksgiving! Would the cooktime change if doubling? Cook time will stay the same. 🙂 Enjoy and Happy Thanksgiving! Do you need to increase the water at all if doubling? Manual release or quick release? Yes quick release. I meant the same thing (i.e. not a natural slow release; you need to do it manually). I can update the recipe if it was confusing. These look delicious! So you just put the carrots straight into the water—no steamer basket or anything? Amazing. You are now on my “go to list” for where to go for trying new recipes, thank you! Your honey glazed carrots are fantastic! I’m amazed that the carrots are just the right texture-not mushy or crunchy.